The figure is forecast to continue increasing as rescuers are searching for 93 missing others, focusing on residential areas buried by mud, rubble and wooden logs. 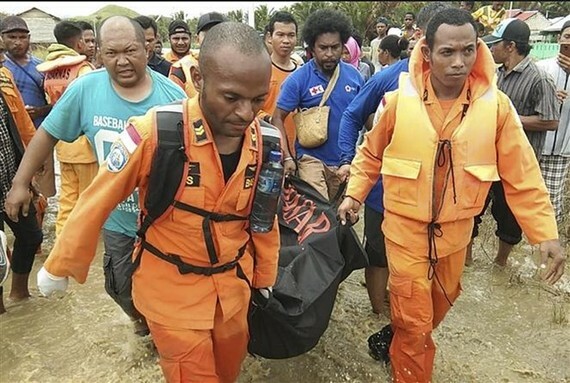 The floods and landslides, which hit Jayapura district at the weekend, also left 84 people seriously injured and 75 others with minor injuries, said Sutopo Purwo Nugroho, a spokesman for the National Disaster Mitigation Agency. The natural disaster also forced almost 10,000 people to flee from home and took shelters at 20 evacuation centres, most of which were government office buildings, the spokesman said. A total of 357 houses, over 100 buildings, four bridges, eight school buildings, five religious buildings and other infrastructures facilities were destroyed, according to the agency. The Indonesian government had declared a state of emergency in Papua province for 14 days. More than 1,600 rescuers, including soldiers and policemen, are finding it difficult to clean up debris. Flash floods have been frequent in remote Papua province, but the one on March 16 evening was among the worst.